​Borussia Dortmund extended their lead at the top of the Bundesliga to nine points after earning a hard fought 2-1 win against Werder Bremen at the Signal Iduna Park. After seeing an effort cleared off the line by Davy Klaassen after only seven minutes, Paco Alcacer broke the deadlock in the 19th minute with a header from Raphael Guerreiro's free-kick that was eventually awarded with the help of VAR, having initially been ruled out for offside. Dortmund then doubled their lead in the 27th minute, as Marco Reus started and finished a swift counter attack with a first-time curling effort beyond the reach of Jiri Pavlenka to give the hosts a two-goal cushion. Werder Bremen, to their credit competed admirably, and were well worth the first-half goal that came in some style ten minutes before half-time, Max Kruse's dipping volley from the edge of the area giving Roman Burki no chance. Bremen began the second half on the front foot, with Kruse forcing Burki into a smart stop, before Jadon Sancho spurned a glorious chance by firing the rebound from Reus' initial shot into the side-netting, albeit from a tight angle. Pavlenka then produced two decent saves in the 68th minute to deny both Sancho and Thomas Delaney, as Dortmund pushed in search of a third goal – which Mario Gotze thought he supplied in added time, only for VAR to confirm an offside in the buildup. It certainly wasn't Dortmund's most impressive performance of the season, but Lucien Favre's side did enough to grind out another important win to extend their lead at the summit of the Bundesliga to nine points. Especially at home, BVB will cause any side problems with their high energy style of play that was epitomised by Reus' goal, while his side also have the craft to unlock defences as their creative free kick for Alcacer's opener also proved. The result also means that Dortmund have sealed the Herbstmeisterschaft, as well as remaining unbeaten in the league so far in what could prove to be a special season for Die Schwarzgelben. Starting XI: Burki (7); Piszczek (6), Akanji (6), Diallo (6), Hakimi (6); Witsel (7), Delaney (6); Sancho (7), Reus (8*), Guerreiro (6); Alcacer (7). Substitutes: Gotze (7), Pulisic (N/A), Philipp (N/A). 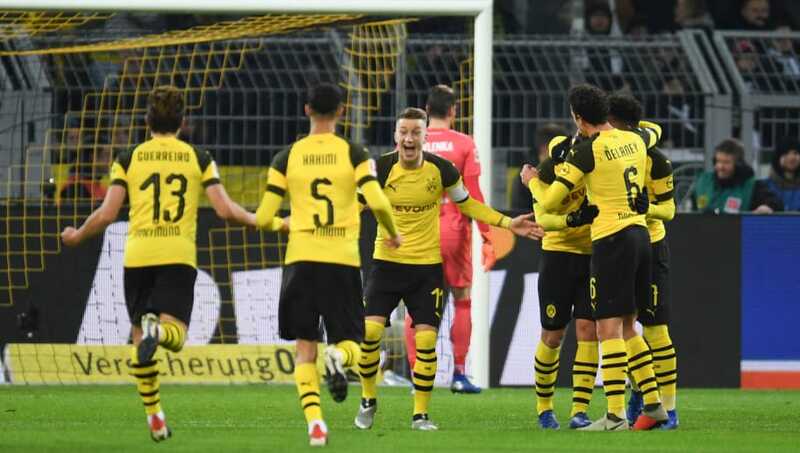 Marco Reus netted his tenth league goal of the season after starting and emphatically finishing a swift counter attack, with the German international at the heart of Dortmund's play going forward. Playing as a number ten, he was able to drift into dangerous positions to find either a pass or a shot, while he wasn't scared to put his foot in and help his side defensively late into the game to help BVB over the line. Top of the league as well. Safe to say that Lucien Favre has done a great job since joining! No one stood out as having a particularly bad game for Dortmund, although Thomas Delaney looked a bit off the pace in the first half against his former club, with the Danish international receiving a yellow card after mistiming one too many challenges. Starting XI: Pavlenka (7*); Gebre Selassie (6); Langkamp (5), Moisander (6), Augustinsson (7); Eggestein (6), Sahin (6), Klaassen (6), Kruse (7); Harnik (6), Raschica (6). Substitutes: Mohwald (6), Osako (5), Sargent (N/A). Both sides are back in action in the Bundesliga this midweek, with Borussia Dortmund away to Fortuna Dusseldorf on Tuesday, while Werder Bremen host Hoffenheim on the Wednesday.